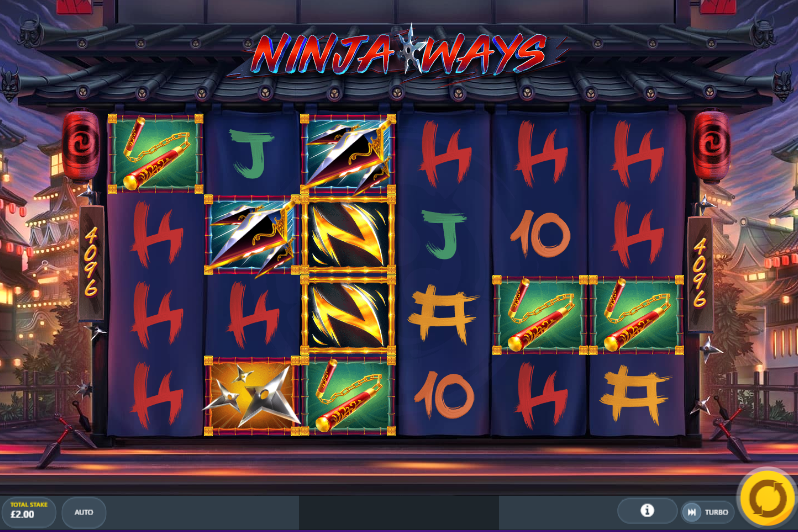 Ninja Ways is a casino slot game from the famous Red Tiger company. It will have a familiar feel to anyone who enjoys Japanese Manga comics, as it is loosely based on the ‘Naruto’ anime series. There are an incredible 4096 ways to spin in wins on the game’s six reels and four rows, and the ninja themed graphics look really good. With a Return to Player rate of 96.03 percent, there is plenty to enjoy in this online casino game. This game is very atmospheric, with its setting being a Japanese village at night – the perfect setting for the stealthy warriors known as Ninjas. Red lanterns and pagodas can be seen in the background. Japanese music and the Ninja’s war-cries add to the sense of oriental adventure. The symbols on the reels consist of items of Ninja equipment, such as nunchakus and kunai. Other symbols include numbers and letters written in a Japanese style. 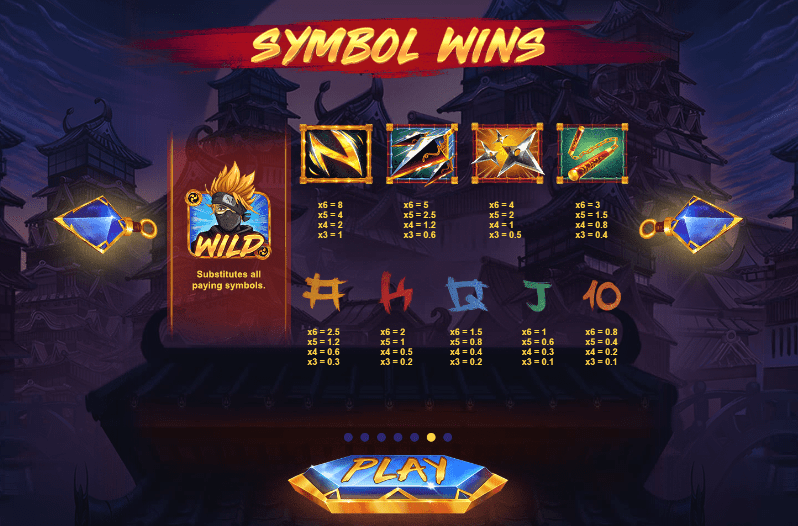 The Ninja himself is the game’s wild symbol, and he substitutes for all other symbols apart from the scatter. The game’s scatter symbol is the yin-yang symbol, adorned with a pair of Ninja swords. It is worth looking out for this symbol, as five of them on adjacent reels will trigger the free spins feature. Additionally, there are three random features that can be triggered. These are Ninja Doors, Ninja Wild, and Ninja Ways, and all three guarantee a win of some kind. Pick up promotions to play on this game right here at Slotsbaby.com. Founded in 2014, Red Tiger Gaming has quickly established itself as a prime player in the slots online games market. The company was founded by a group of Asian and European games industry veterans, and has its head offices in the United Kingdom, on the Isle of Man. The company enjoys a particularly good reputation for the quality of the graphics and sound in its games, and Ninja Ways certainly fits into that tradition. Red Tiger also looks to innovate when it comes to the structure of its games, and features such as daily jackpots and ceiling jackpots often occur in their titles. Their use of HTML5 means that their games can be played on any size of device. This game is a thing of beauty, with its graphics being truly great. Those fine graphics help to create an immersive experience, which is further enhanced by the exciting game mechanics. Anyone who enjoys playing fruit machines should make a point of playing this game. The extra features offer heaps of excitement, and this is a game that will keep you coming back to it time after time. Look out for Ninja Ways in your favourite online UK casino.